Allison Janae Hamilton’s Spirit Sources | The New York Times Her multimedia art never strays far from her concern with the land, especially the Southern land, and its occupants, especially its black occupants. Indoors, for Allison Janae Hamilton, is always a kind of compromise. She grew up in Florida — first in Miami, attuned to the ocean and the Everglades, then in Tallahassee, with its exuberant tree cover, and where she enjoys kayaking in the haunting cypress swamps. Childhood summers were spent in western Tennessee, returning for planting and picking time on her maternal family’s farm. Her multimedia art never strays far from her concern with the land, especially the Southern land, and its occupants, especially its black occupants. “The Hours,” from 2015, is an archival pigment print. She recruits family or friends to play fantastical characters in her photographs and videos. The Dollbaby, with stag’s head, is a friend from Florida. Image Credit. Allison Janae Hamilton. Her work has an unabashed pastoral quality. Yet every rustic setting where she stages her photography, every clip and sound in her video works, every artifact in her installations — the fencing masks, the tambourines, the bundles of horsehair, the taxidermy alligators — is present for a reason. Her aim is to manifest history: that of her family, the black South, and by this method, the nation. Installation view of a deconstructed pine forest in “Pitch,” Ms. Hamilton’s first museum solo exhibition, currently at Mass MoCA. Credit Allison Janae Hamilton and MASS MOCA. Image Credit. Photographed by David Dashiell. Ms. Hamilton, 34, is based in New York: She arrived here in 2006, fresh out of Florida State University (where her father, Leonard Hamilton, is the head basketball coach), and after a stint in fashion, began earning graduate degrees. 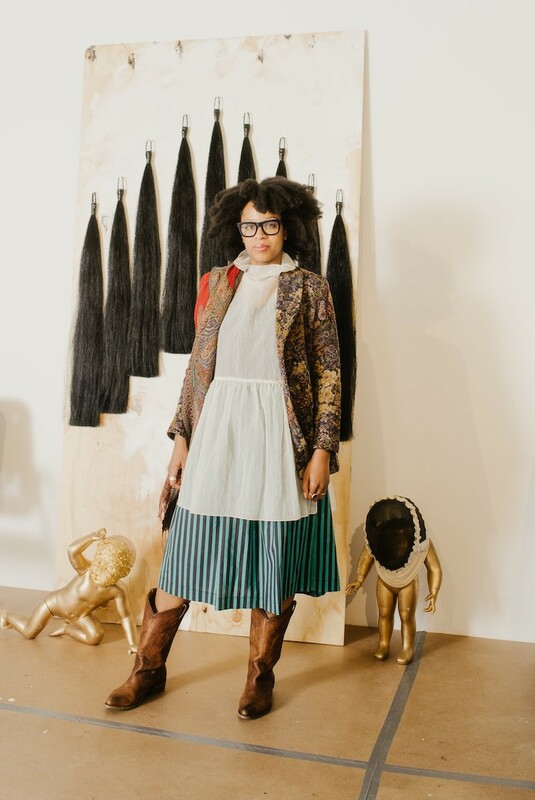 Before receiving her M.F.A., from Columbia in 2017, she already had a Ph.D. in American Studies from New York University, where she studied with the photography scholar Deborah Willis and wrote a dissertation on the carnivalesque in black visual culture. In the summer, she goes upstate weekly to ride horses.